Dating can be fun if you get to do it with the right person. Searching for such person can be a lot of painstaking. Even if you get to land your dream girl or boy, chances are that something or others just drive you away from her or him. So, where can you really get that charming prince or beautiful princess of your life? The answer to that is locked with the people who are known to society as recruiters. And I am sure that after reading this article you would all be dreaming about dating a recruiter guy or girl right away. So, here are the reasons as to why you should start dating with recruiters. No one can deny this fact that the most important skill that the recruiters have is that of listening to talks and problems of other people. Working in HR field, they get habituated to listening. As you may also know that for any relationship to exist, one of the most important things that partners should have is proper listening skills. Therefore, you can be rest assured that your partner will be interested in listening to each and every word of yours, no matter how trivial or how important it is. You will be happy to have such a dating partner. In a dating situation, you are just at the starting point to explore about each other. Because of which, you would be cautious of what you say or what you may utter. Similarly, the other person may not be open about everything. Such situation though completely normal can sometimes act as a friction between you two. Recruiters, on the other hand, are very prompt in communicating their thoughts and feelings with ease. So you can rest assured that your date is competent in expressing feelings or any idea or thought that might be going on his or her mind. That may sound like something to be suspicious about and indeed you should be, but the nature of their job has turned them into such activities. On the bright side, if you are already in their more radar as a potential date then chances are that they would have already gathered a lot of information about you so that they would be ready to be that perfect person on your first date. This will not only help to make it easy to date each other but you would also be at ease that you are dating someone who is so much interested to know about you. Working as a recruiter, they need to handle a lot of resenting people who are full of agony and depressed to those who are super excited. You can say that they handle people who are at both the extreme position of emotion line. So whenever your spirits are low and you feel utterly helpless, you can be sure that your recruiter will be at your side to comfort you and handle you through such delicate time. Being good at understanding human emotion they know what to say and how to put you at ease with the situation. If you are someone who loves to date with a person who is always at their best looks then recruiters should be your ideal type of person as their wardrobes are equipped with suits for every occasion. In the field where look matters, they cannot afford to look lame. So expect your partner to be at their best whether it’s your first date or some nth date. On the other side of the story, you can expect that your partner must also be expecting you to be well dressed, at least for the first few dates if not in long run. Whatever the situation may be, they are always presentable in any situation. Recruiters are people pleasing at the core and they have a keen eye to details. Being at the receiving ends you will be one loaded with compliments if nothing else, for they love to appreciate people for their real beauty. They can always keep you happy as they will be lifting up your confidence and will boost you at the times of need. 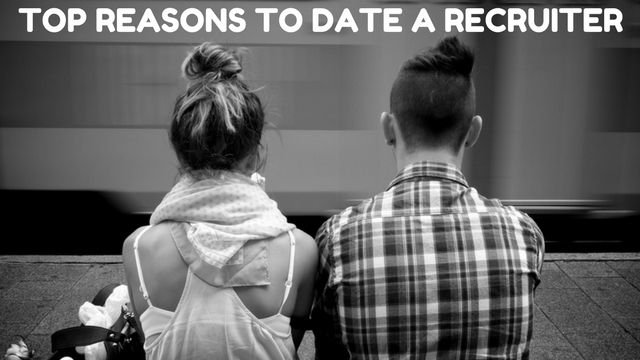 You would be never out of reasons as to why you would not continue to date him or her, and the recruiter will do whatever it takes to keep you happy and interested in him or her. Recruiters are one of the most organized persons as their work demands them to be at feet to feet with time and making sure to make its best use. This also includes making notes about important dates and things to remember. You can expect your partner to be extra punctual in the matters of time and date. In certain case, it may sometimes become difficult for you to keep up with their tight schedule. But they are a master planner and they would also include this factor into their calculations. Being against time all the time, they are bound to develop expertise in multi-tasking. You would be rather surprised how they are good at handling multiple tasks with such efficiency. Referring to the last point you can get an idea about their tight schedule. So multi-tasking is the only way for them to pack a multitude of work within the short package of time. In a dating scenario, this can fill you up with explosions of surprise as they would just be bursting out with many imaginable surprises at the same time. Dealing with people demands you that you are first confident about yourself, and about what you think so that the other person who is seeking your help can be confident about your opinion and keep it in high regards. Talking with such persons will only ensure that you get a chance to pick up some or the other trait of confidence. Who knows you may be enchanted with their level of charm and confidence even without your knowledge or maybe it would be more than that. You never know. Learning and decrypting a person’s personality is the trait of their job. They leave no stones unturned to learn everything about the person sitting next to them. This makes it interesting as you will be with a person who is ever interested to know every fine detail about you, your life and any event related to you. Unlike, those you who are busy in their own world, the recruiter will love to share a great amount of time exploring and discovering inner you. Also, you would be happy to share your details with your partner who has the interest to know about you. This is the most obvious benefit that you can get from dating a recruiter. But that’s not the end of the story. When you are dating a recruiter, you can have an added benefit to getting tailored made recommendation for the job. Not only that, you can also be sure that he or she will do everything to make sure that you get to land a job with great pay, without any hurdles and with lots of perks. He or she can even recommend your name to other great companies which he or she would not do otherwise. Rest assured you will be employed all the time unless you have other plans. This is the most anxious time period for any partners in when they are about to meet their partner’s parents. Expectations, hopes and everything in between, all those get at stack when meeting the parents. But with a recruiter as your partner by your side you can well expect to be at ease in conversing with your parents-in-laws. Not that they are different from other parents but it is your partner that will already make arrangements to make the meeting a wonderful start of the new journey rather than something to dread about. If you are a social lover then you will be more than happy to have a recruiter as your partner. Being a social animal in a literal sense they are ever present in all social media platforms and they will contact you through whatever medium is available to them at their disposal. Not to be afraid of being stalked online, the recruiter will do whatever it takes to grab your attention and keep you engaged with them whether online or offline. You will never be out of surprises. Whether it’s facebook, twitter or its an extrovert event like Meet up or Groupon. You will enjoy their presence even online. Do you have trouble conversing with new people? Or is someone annoying you? Not to worry, your partner will have it all handled out with ease. A person with qualities and job requirement of dealing with many types of people, your partner will be more than happy to keep you at ease while he or she will do the difficult job of talking to strangers or annoying people. You will never ever hear any complaint from their mouth. At the same time, you can be relaxed about the public affair as you have got an expert by your side. Unless it’s a matter of grave problem, you will be happy to know that you and your partner will mostly be at ease with each other. You will rarely get into a fight with your partner as your partner by default is trained in learning human emotion. So, he or she can effectively manage any issue that can cause any conflict between you. Other than that, your partner, like you, will always do new and interesting things to keep you happy about yourself and about your relationship. Confidence, altruism and understanding people are some of the trait marks of recruiters that make them agreeable persons. You will never find it difficult to agree with your loved ones as he or she will make sure that before any such situation arises, all the core points are discussed out and settled down to common points on which both of you can happily agree to abide. Recruiter are good not because they have good ideas but because they are good at selling an idea. Do not worry, your partner in no way will sell you something which will be harmful to you or to the relationship. If nothing else satisfies you, then this point will satisfy your soul that you will be living a royal size life. If not in the way of money then at least in the way that your partner is someone who is good at remembering dates, ever interested in learning about you and your life, keeps you at ease by making your work a bit less and everything else that makes it comfortable to you especially the part of dealing with unknown people. So what are you waiting? Do you have any recruiter guy or girl currently on your radar and you are still thinking that whether you should go for a date or not? Then think no more. Take your first step and rest assured, you will be the happiest person in the world and be thankful for the partner who will always be there by your side.